Ce chalet lumineux et calme est situé sur 6 hectares boisés à seulement quelques minutes de Ganges, Salt Spring Island, BC. Il s’agit d’une escapade romantique idéale pour les personnes qui ont besoin d’une pause dans le rythme effréné de la ville. Il est à seulement quelques minutes du célèbre marché du samedi du Gange. Un rapide trajet jusqu'au mont Maxwell vous amène aux meilleures vues sur le sud des îles Gulf. Comme le yoga? Eh bien, nous sommes à quelques pas d’une route de campagne menant au centre de yoga de Salt Spring Island. Les propriétaires sont un acupuncteur certifié et un expert en Rolfer. Nous vous apporterons les traitements. Le paradis ne vaut pas mieux que ça. What a wonderful place. If you’re looking for a peaceful, cozy nest surrounded by beautiful nature this place is for you. Great hosts, great cabin, great spot. Cute, quaint, and cozy. 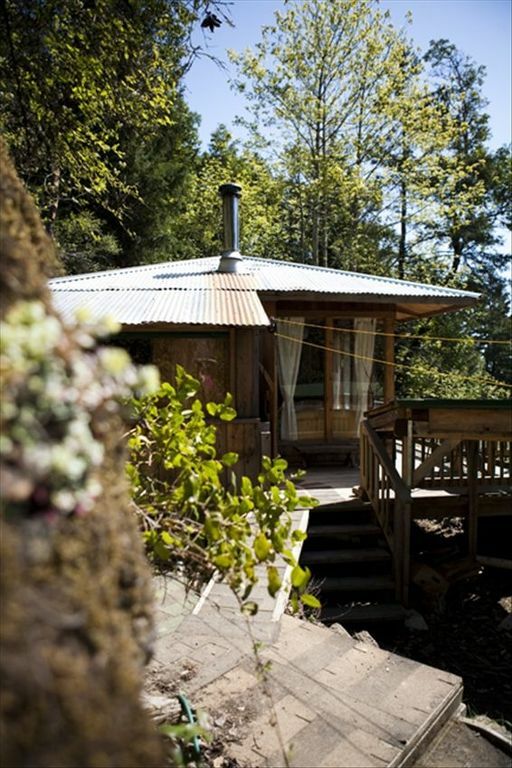 The perfect Salt Spring stay. This little cabin nestled in the trees is full of character and charm. It is simple but all you really need. The wood stove fire is adorable and provided the perfect amount of heat. The box full of wood was much appreciated as well. Basic kitchen necessities included, nothing fancy. The host was so warm and welcoming and ensured we had everything we needed. We will definitely book here again. We enjoyed everything about this cabin. It is set on the rocks with big windows. Totally private. We had a wonderful time in this hidden gem. You are tucked away in the woods with no one around to bother you. It has everything you need inside to relax and enjoy Saltspring. My husband and I loved the cozy cottage that had tons of natural light and was away from the masses of folks in Ganges (downtown on the Island). We appreciated having the full kitchen and full laundry facilities, as well! One thing I would mention is that the pictures don't show that there is a main road below the cottage with some traffic (Cranberry Road) that also is the road that goes up to Mount Maxwell. We'd recommend this place to friends and family and we would stay again. This place was perfect. the bathroom had ceiling high windows so that you were constantly looking at nature. the tub was a perfect fit for two, with a lovely shower. The kitchen had all your basic needs. The fire place was amazing and wood was stacked outside for ease. The hosts and interactions were smooth, and we were left alone so it felt like we were truly in our own space. Would visit again, and highly recommend!!! Samedi célèbre marché à Ganges, Artiste tournée dans toute l'île, à 15 minutes de vues du mont Maxwell, Ruckle Park, 10 minutes à pied du Centre de Yoga de Salt Spring, à 2 minutes de Golf, à quelques minutes de l'océan et des lacs.